Hershey Medical Center, Hershey, Pennsylvania. 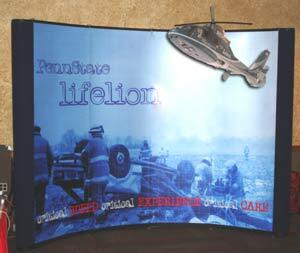 The "Life Lion," of Penn State Milton S. Hershey Medical Center, (Hershey, Pennsylvania) now has an excellent Portable Tradeshow Display! What made this display so unique was the Tradeshow Display graphics were designed by Clayton Wood. Clayton is one of the dedicated men who save lives on the "Life Lion" medical staff. Clay also has the unique ability to turn out some professional Tradeshow Display graphics! We gave Clayton the basic parameters for developing the Tradeshow Display graphics. He took it from there. Awesome display Clay. Great job! Printed Tradeshow Display Graphics on one of our high resolution large format printers. Laminated graphics with special Tradeshow Display polycarbonate over-laminate. Fixed hanger bars and kick plates to Tradeshow Display graphics. Applied magnetic strips to Tradeshow Display graphic panels so they would adhere to Display frame. Custom built the Tradeshow helicopter. Give me a call for help with your Tradeshow Display. We'll try and get you "Best of Show" too. Elements of a Successful Tradeshow Display. 1. Simple Tradeshow Display Design. 2. Easy to identify all elements of Display. 3. Tradeshow Display has vibrant colors. 4. Tradeshow Display includes motion. 5. Tradeshow Display has blinking lights. 5. Tradeshow Display evokes emotion. 6. Tradeshow Display is consistent. The helicopter for the "Life Lion" Tradeshow Display started with a high resolution photo. We enlarged the photo proportionately to approximately 53 inches in length. This provided nice, balanced coverage to the Tradeshow Display. Next we printed the helicopter and laminated it for protection. The helicopter was then mounted to a foam core board. We then meticulously cut out the helicopter using an "Xacto" razor. The rotating blades were cut out of ABS plastic. They were covered with a faux chrome vinyl. This created a real-to-life aluminum finished look. Next small holes were drilled and the blinking strobe lights were set in place. Attention to detail is what makes for a winning Tradeshow Display. Give us a call for your next project. My name is Mike, I'd be happy to help.